Sometimes an idea emerges and it changes everything. Back in 2012 we were asked to help our intern William Sieghart, founder of National Poetry Day and the Forward Prizes for Poetry with a concept. He had just published poetry anthology Winning Words, and was seeking a creative solution to make poetry more accessible to the world. 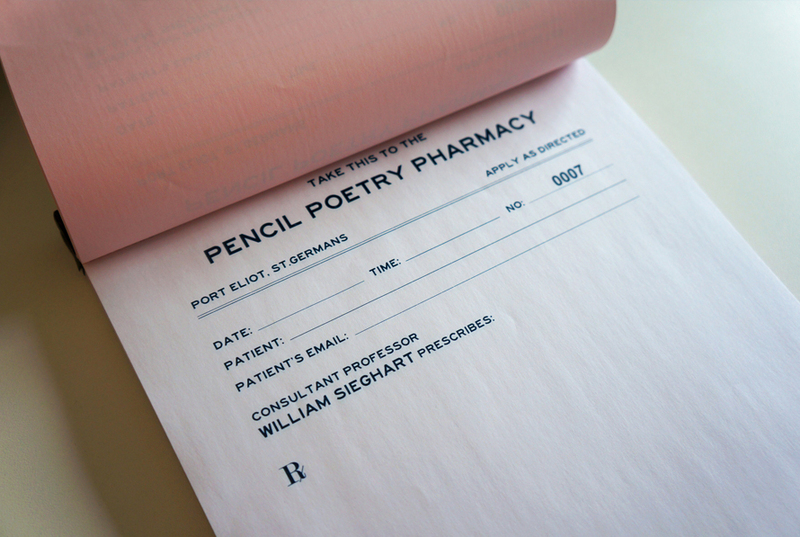 Our creative director Jenny Dyson came up with the idea of the Pencil Poetry Pharmacy, in which poetry rather than pills would be prescribed for the metaphysical needs of ‘patients’. An old school prescription pad was created and the concept was launched at Port Eliot Festival. The ‘ Professor’ was of course William Sieghart. The intention was that he listened with an open heart to all and any ailments, and recommended balms to read in times of trouble and strife. The concept was an astounding success. William appearred on breakfast TV, he travelled the UK and he prescribed many thousands of poems thereafter. The culmination of all this resulted in a book deal for William with Penguin. The Poetry Pharmacy, Tried - and True - Prescriptions for the Heart, Mind and Soul published late last year. It is publishing in the US later this year and a live event in stage with actors reading the ailments - and the poems - is happening later this year. We couldn’t be more proud of manifesting this idea and witness it taking on a life of its own. Everyone who walks this earth experiences pain and suffering. Poetry can soothe the pain and can heal the heart. This project is testament to that.